I had surgery on my ear at the beginning of April and the nursing staff was really thorough about prepping me for the occassion. I even had to take off my little necklace that my boyfriend gave me a literal 5 days after we DTRed or whatever MTV is making you call becoming official these days. I hadn't taken that thing off since November of 2009. Like I half my skin cells have been on my body for less time than that necklace. So, naturally, I assumed they were going to be pretty strict about what my hair was doing during this surgery, it being so close to my ear and all. I asked if I needed to put it up a certain way or something and they explained they were going to wrap it up and it would be totally fine. Smash cut to me coming to from the anesthesia and my nurse telling me that everything went totally fine... minus the fact that they dyed my hair blue. Just dyed my hair blue when marking out where to slice and dice my ear. Not even in streaks or anything I could pass off as something deliberate. Just random chunks on my ends like I was Stripped era Christina Aguilera with a bad hairstylist or a scene kid circa 2006 who brags about doing their own hair on their Myspace profile. 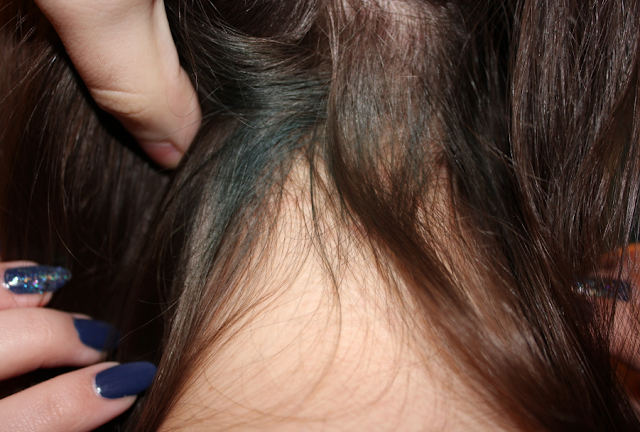 I don't know how or why but random pieces of my hair were just blue. There was no hiding it. My hair is a light reddish brown so that color of greenish blue was probably the most LOOK AT ME color that random chunks of my hair could be dyed. I stared at the boxed dyes in Ulta and thought about just taking care of it on the cheap but I just couldn't. My hair is so fine and dry as is and using boxed dyes just turns it to brassy straw. I cut my ends kind of haphazardly to fix the problem and it really pained me to do that. 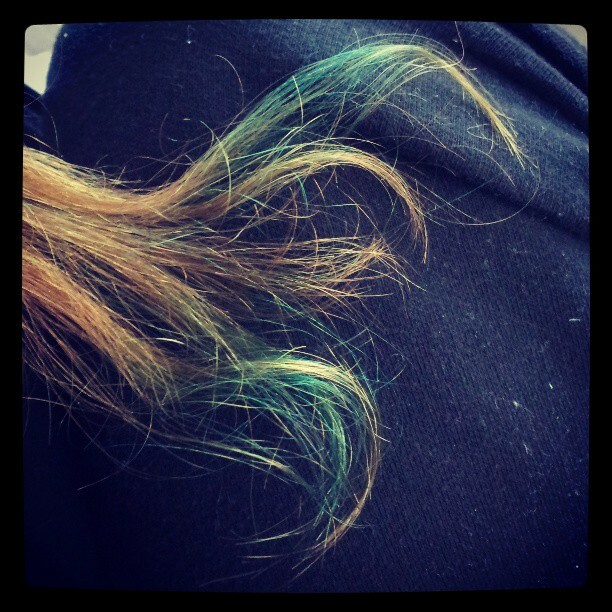 I probably cut off a solid 4 inches off and there was still an inch or so of blue on some of my ends. I just couldn't stand to hack anymore off. My boyfriend sat and watched me downgrade my hair from super long to just plain long and listened to me complain about how much I hated to do it but how I had to because I was so sick of the blue and I'd just have to deal with the little bit I was leaving on the ends. Just sat and watched and waited until I was done. That's when he said, "But what about all the blue at your roots?" I guess I should have gone with destroying my hair with the $10 box of dye and getting rid of the blue rather than destroying my hair with scissors and getting rid of 40% of the blue, huh? Trick question, I should have just had professional hair stylist at a professional salon do a professional job.